Most Muslim Americans continue to reject violence and extremism. As in 2007, very few see suicide bombing and other forms of violence against civilians as ever justified in the defense of Islam, and al Qaeda is even less popular than it was then. At the same time, there is extensive concern among Muslim Americans about Islamic extremism, both around the world and in the United States. On foreign policy, Muslim Americans are critical of the U.S. war in Afghanistan, though no more so than in 2007. Muslim Americans take a cautious view of the “Arab spring” – as many say they support stable governments in the region, even if that means less democracy, as say they support democracy, even if that means less stability. About eight-in-ten American Muslims (81%) say that suicide bombing and other forms of violence against civilians are never justified in order to defend Islam from its enemies. Just 8% say these tactics are often or sometimes justified. There has been virtually no change in these opinions since 2007. U.S. Muslims are far more likely than Muslims in most of the predominantly Muslim countries surveyed by the Pew Global Attitudes Project to say that suicide bombing in the defense of Islam is never justified. Among the seven Muslim publics surveyed, only in Pakistan (85% never justified) and Indonesia (77%) do comparably large numbers reject suicide bombing and other violence against civilians. Muslim Americans continue to express extremely negative views of al Qaeda: Just 5% have a very or somewhat favorable opinion of al Qaeda; 11% have a somewhat unfavorable view and 70% have a very unfavorable opinion. The proportion of Muslim Americans with a very unfavorable view of al Qaeda has increased 12 points since 2007 (from 58%). Muslim Americans express more negative views of al Qaeda than do Muslims in most of the Muslim countries surveyed by the Pew Global Attitudes Project. Fewer than half of Muslims in the Palestinian territories, Indonesia, Egypt and Jordan express a very unfavorable view of al Qaeda. Only in Lebanon does a higher percentage of Muslims express a very unfavorable opinion of al Qaeda (92%). As in 2007, there is no group of Muslim Americans in which even a quarter expresses a favorable view of al Qaeda. More than half of native-born African Americans (56%) express very unfavorable opinions of al Qaeda, as do 67% of other native-born Muslims and 75% of foreign-born Muslims. The proportion of African American Muslims expressing very unfavorable opinions of al Qaeda has increased 17 points from 39% four years ago. 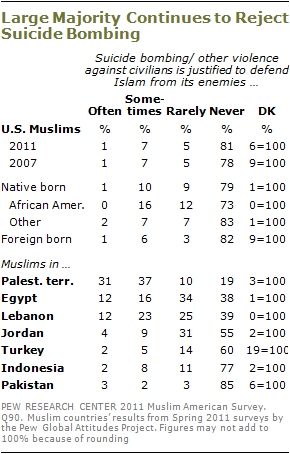 More foreign-born Muslims also express very unfavorable opinions of al Qaeda than in 2007 (75% today, 63% then). Majorities of both the general public and Muslim Americans express concerns about Islamic extremism. Among Muslim Americans, 60% say they are either very (31%) or somewhat (29%) concerned about the possible rise of extremism in the U.S. Similarly, 67% of the public says they are at least somewhat concerned. There has been no significant change since 2007 in U.S. Muslims’ concerns about the possible rise of Islamic extremism in this country. More native-born Muslim Americans than immigrant Muslims say they are concerned about Islamic extremism in the U.S. Among those born in the U.S., 73% are at least somewhat concerned about the possible rise of Islamic extremism in this country. By contrast, just 53% of foreign-born Muslims say they are at least somewhat concerned. Both Muslim Americans and the general public also express concern about the rise of Islamic extremism around the world. Nearly three-quarters of both groups say they are at least somewhat concerned about this (72% among Muslim Americans, 74% among the general public). Although many U.S. Muslims express concern about the possibility of rising extremism in the U.S., far fewer say there is currently much support for extremism within the Muslim American community. Most (64%) say there is not too much support (30%) or no support at all (34%) for extremism among Muslim Americans. About one-in-five (21%) see either a great deal (6%) or a fair amount (15%) of support for extremism in the Muslim American community. By contrast, 15% of the general public believes that there is a great deal of support for extremism among Muslim Americans, and an additional 25% see a fair amount of support. 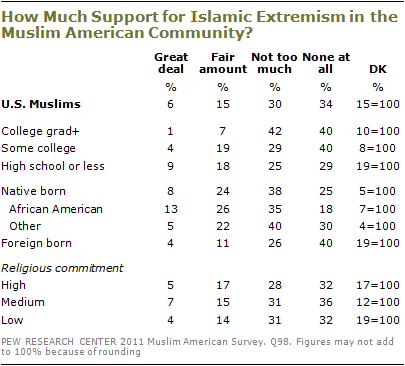 Very few Muslim Americans believe that support for extremism is increasing in the Muslim American community. Just 4% say this, while 15% say support for extremism is actually decreasing. Three-in-ten (30%) say the level of support for extremism is staying the same. The general public’s perception on this question is quite different. Nearly one-quarter (24%) say support for extremism is increasing in the Muslim American community. Just 7% say it is decreasing. Native-born Muslims, particularly African Americans, are more likely than those not born in the United States to say there is at least a fair amount of support for extremism in the Muslim American community. Among Muslims born in this country, 32% see at least a fair amount of support for extremism, while 25% say there is no support. Among Muslims born outside the U.S., just 15% say there is a great deal or fair amount of support for extremism, while 40% say there is no support at all. College graduates are less likely to see support for extremism in the Muslim American community than those with less education. There are no significant differences in views of support for extremism by age or religious commitment. Have Muslim Leaders Done Enough? Nearly half of Muslim Americans (48%) say Muslim leaders in the United States have not done enough to speak out against Islamic extremists. Just 34% say that Muslim leaders have done enough to speak out against extremists. In contrast, 68% say that Muslim Americans are cooperating as much as they should with law enforcement officials investigating extremism in the Muslim American community. Men are evenly divided in their views of whether Muslim leaders have done enough to speak out against Islamic extremism – 44% say they have, while 46% say they have not. By comparison, just 23% of women say Muslim leaders have done enough to speak out against extremism, while 51% say they have not done enough; 26% of women offer no opinion. A majority of Muslims born in the U.S. (59%) say Muslim leaders have not done enough to speak out against Islamic extremism; 33% say they have done enough. Opinion is more divided among foreign-born Muslims: 43% say Muslim leaders have not done enough, 34% say they have, while 23% express no opinion. Muslim Americans have a more positive view of the U.S. effort to combat international terrorism than in 2007. 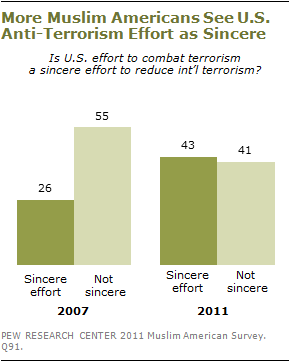 Currently, 43% say the U.S. effort to combat terrorism is a sincere effort to reduce international terrorism while about as many (41%) say it is not sincere. Four years ago, during the Bush administration, just 26% viewed the “U.S-led war on terrorism” as sincere while about twice as many (55%) said it was not. The view that the U.S. campaign to combat terrorism is a sincere effort has increased across many subgroups in the U.S. Muslim population. This measure has not been included on the international surveys of the Pew Global Attitudes Project recently, so a direct comparison between Muslims in the U.S. and those in predominantly Muslim countries is not possible. Muslim Americans are evenly divided in their opinions about democracy in the Middle East: 44% say it is more important to have democratic governments, even if there is less stability in the region; 44% say it is more important to have stable governments, even if there is less democracy in the region. In a March 2011 survey by the Pew Research Center for the People & the Press, the public viewed regional stability as more important than the spread of democracy. A 52% majority said it is more important to have stable governments, even if it means less democracy; 37% said it is more important to have democratic governments, even if it means less stability. There is more support for democracy among college graduates, both among Muslims and in the general public. Among Muslim Americans, 59% 0f college graduates say that democratic governments are more important than stability in the Middle East; that compares with 36% of those with some college education and 40% with no more than a high school education. There are similar differences by education among the public. 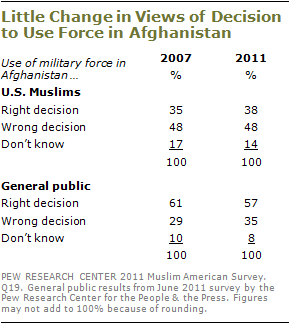 Muslims in the United States remain more opposed than the general public to the decision to use military force in Afghanistan. Currently, 48% say the decision to use force was wrong while 38% say it was right. These views are virtually unchanged from 2007. Among the general public, 57% view the decision to use force in Afghanistan as right and 35% say it was wrong, according to a June survey by the Pew Research Center for the People & the Press. The public’s views also are little changed from 2007 (61% right decision vs. 29% wrong decision). As was the case in 2007, most Muslim Americans do not view Israel’s existence as being incompatible with the rights of the Palestinians: 62% say that a way can be found for Israel to exist so that the rights and needs of the Palestinian people are taken care of. These views are virtually unchanged from 2007. Muslim Americans’ views on this question closely resemble those of the U.S. general public, among whom 67% say that a way can be found to enable Israel to exist so that Palestinian rights can be taken care of. In contrast, majorities or pluralities in most predominantly Muslim nations surveyed by the Pew Global Attitudes Project in 2007 expressed the view that the rights and needs of the Palestinian people cannot be taken care of as long as the state of Israel exists.